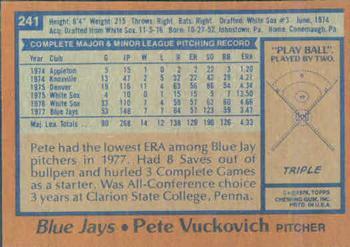 He was an original Blue Jay. He wasn't here long. He recorded the first Jays shutout. He recorded the first Jays save. 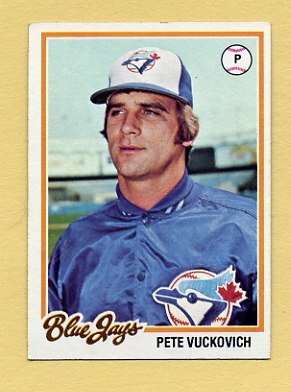 So one could say Vuckovich was responsible for the first great double-play combo in Jays history as well as some major pieces in the Jays farm system. Not too shabby. After a couple of solid seasons with the Cards, he was flipped to the Brewers where a torn rotator cuff a few seasons later ended his career. While he was in Milwaukee, he owned a bar with Gorman Thomas called Stormin' & Vuke's. The folks in Milwaukee liked him so much that when he retired he moved to the booth, doing colour for Brewers broadcasts for the next three years. During that time, Hollywood came calling and he played Clu Haywood in Major League. Possibly because the cast would all hang out in his bar. In 1992, the Pirates hired him as a pitching instructor and he worked his way up the ranks to end up as a special assistant to the GM. Jack Z then hired him away for his Seattle front office. This past year, after losing his job in the purge following Jack Z's departure, he joined the Diamondbacks as a scout. Gotta say, sounds like a pretty good life.